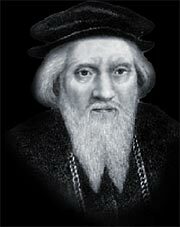 Giovanni Caboto ( c. 1450 – c. 1499), known in English as John Cabot, was an Italian navigator and explorer commonly credited as one of the first early modern Europeans to discover the North American mainland, in 1497. Giovanni Caboto was born around 1455 in Genoa, Italy according to old papers about his family. His name is also associated with Venetia, where he spent some time there as a boy. In fact by 1461 Caboto was living in Venice, where he became a citizen. In about 1482 he married a Venetian woman, Mattea, and they had three sons: Ludovico, Sebastiano and Sancio. A merchant like his father, Cabot traded in spices with the ports of the eastern Mediterranean, and became an expert mariner. Valuable goods from Asia - spices, silks, precious stones and metals - were brought either overland or up the Red Sea for sale in Europe. Venetians played a prominent part in this trade. Then, about 1490, Cabot and his family moved to Valencia in Spain. It is probable that, like his fellow-countryman Christopher Columbus, Cabot wanted to be part of an expanding frontier of exploration, the Atlantic Ocean. The leaders in this enterprise were the Portuguese, and the Spanish were also interested. The monarchs of both countries wanted to find new routes to Asia and its riches - routes which would avoid the Mediterranean and the virtual monopoly on the spice trade held by the Italians. There was another motivation as well. In a deeply religious age, Europeans wanted to spread knowledge of Christianity, and to contain the spread of Islam. However, neither Portugal or Spain was interested in John Cabot. The Portuguese pioneered their route to Asia by sailing down the African coast and around the Cape of Good Hope. And once Columbus had returned in triumph from his first transatlantic voyage in 1493 - he reached the Caribbean, but thought it was part of Asia - the Spanish likewise thought they had found their route to the east. As a result, Cabot turned in 1494 or 1495 to England - to the merchants of the port of Bristol, where he settled with his family, and to the king, Henry VII. His scheme was to reach Asia by sailing west across the north Atlantic. He estimated that this would be shorter and quicker than Columbus' southerly route. Cabot was trying to go one better. In England, Cabot received the backing he had been refused in Spain and Portugal. First,the merchants of Bristol agreed to support his scheme. They had sponsored probes into the north Atlantic from the early 1480s, looking for possible trading opportunities. Some historians think that Bristol mariners might even have reached Newfoundland and Labrador even before Cabot arrived on the scene. Sir Francis Bacon, in his book The History of the Reign of King Henry VI mentions that ...it is likely that the discovery first began where the lands did nearest meet. And there had been before that time a discovery of some lands, which they took to be islands, and were indeed the continent of America, towards the north-west. And it may be, that some relation of this nature coming afterwards to the knowledge of Columbus, and by him suppressed (desirous rather to make his enterprise the child of his science and fortune than the follower of a former discovery), did give him better assurance that all was not sea from the west of Europe and Africke. If Columbus knew about it in 1492, it's certainly possible that Cabot knew about it 5 years later in 1497.
Letters patent for a voyage to discover new lands granted to John Cabot and his three sons by the king of England, Henry VII, at Westminster on March 5, 1496.